Take a pan, with a heavy bottom, add little water first. This will prevent the milk from burning. Now add the milk, and start boiling until the milk thicken to 1/3 of its original quantity. It'll take 30 to 45 minutes. Add the crushed green cardamom and sugar and again boil for 5 minutes. In the meantime, take the Rosogollas and squeeze them to extract the syrup. Now add the squeezed Rosogollas into the milk pan and boil for 5 more minutes. In this way, the Rosogollas will absorb the milk. that's it. Turn off the heat and let the Payesh cool down completely. 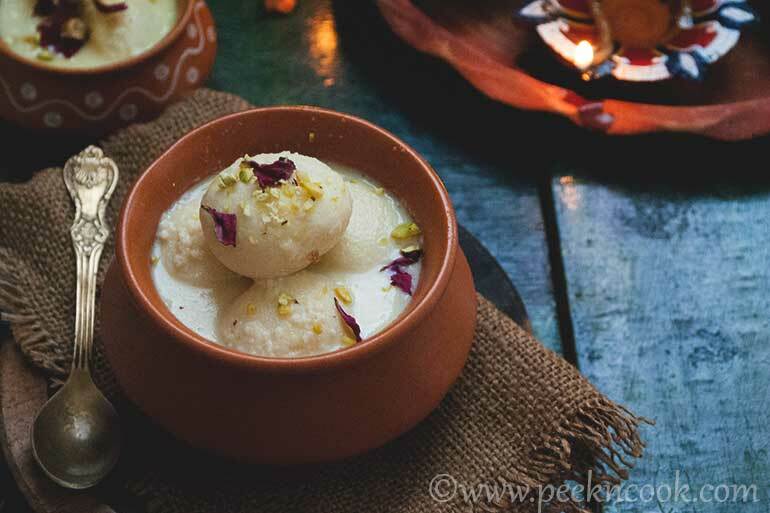 Now garnish the 'Rosogollar Payesh' with chopped pista and dry rose petals and serve. Or you may keep 'Rosogollar Payesh' inside the refrigerator and serve chilled. PeekNCook has a massive collection of recipes that are submitted, rated and reviewed by people who are passionate about food. Recipe creator, Culinary Instructor, Food Reviewer. Stay updated, all recipes in your inbox! Free & unsubscribe anytime.